Erma Martin Yost graduated from James Madison with an MA in Painting and Ceramics. Noho Gallery in Chelsea represents her where she has had 19 solo shows. Yost’s work is in the permanent collection of the Museum of Art and Design and was included in their New Acquisitions exhibit in 1995. Yost received a New Jersey Council on the Arts fellowship in 1991 and 1999. 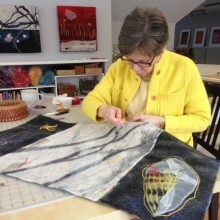 Through the New Jersey Art Annual: Crafts exhibitions, her work has been exhibited in the Jersey City Museum, the Newark Museum, the New Jersey State Museum, the Hunterdon Museum, and the Morris Museum. Her work is appears in twenty books, including The Art Quilt Book by Robert Shaw. 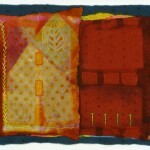 Most recently Yost’s felt work was included in 1000 Artisans Textiles by Sandra Salamony and Gina M. Brown. Examples of Yost’s work can be viewed at her website: ermamartinyost.com.